MarkAudio-SOTA invites you to “hear our difference” at the LA Audio Show June 2-4th. This showcase is also the US Market launch celebration of the company’s new Cesti MB monitor speakers, offering the rich midrange that is typical of a wide-range, single speaker design, plus the high-impact dynamics typical of multi-way speakers. Here some of the highlights about these speakers, along with details about each model. All cabinets, crossovers and speaker drivers are engineered in tandem to create an end product that exceeds the sum of its premium parts. The wide dispersion and shallow-profile cone drivers replace conventional cone-woofer and dome-tweeter combinations. With matched dispersion and output characteristics, along with a low order crossover slope, the two custom-made SOTA drivers provide a seamless integration between high and low frequencies. This integration results in a smooth, natural output and soundstage that affords a wider range of seating positions, allowing several people to hear a top quality performance simultaneously. MarkAudio-SOTA’s unique All-Range driver approach offers the rich midrange that is typical of a wide-range single speaker design, while providing a dynamic, full frequency range extending from 40Hz to 25kHz. The three dual driver speakers’ systems use different combinations of a custom-designed, 110mm (SOTA 11) wide-range mid-bass driver mounted in a ported cabinet along with an acoustically isolated 50mm (SOTA 5) tweeter. Both drivers use a low mass, mixed-alloy cone that generates exceedingly accurate audio transparency with incredible detail. The company’s two-way speakers utilize a 2.4 kHz crossover frequency with gentle, 2nd order electrical and acoustic slopes that gradually blend the outputs, maximizing the advantages of the symmetrical, all-range wide-dispersion drivers. The simple design, with few reactive components, also aids in amplifier matching, allowing MarkAudio-SOTA speakers to be easily driven by low-power designs. The result is a 2-way loudspeaker without any obvious crossover transition, and a smooth, transparent, yet dynamic and natural musical response especially apparent in vocal reproduction. MarkAudio-SOTA’s small bookshelf speakers combine Italian style with British engineering design that follow the company’s “Hear Our Difference” audio philosophy.The speakers utilize a single all-range symmetric driver to create a full range loudspeaker in an elegant and finely finished cabinet.Our proprietary minimalist control network [MA1] intelligently controls the driver, delivering pure music to the listener while minimizing artificial processing. Laminated dual-core panels and space-age polymers provide enclosures of maximum strength and acoustic stability. The result is statement-level sound quality for the discerning listener. Available in three colors (black, red or white). MarkAudio-SOTA’s flagship 2-way, stand-mount loudspeakers combine a unique Italian design style with British engineering that follows the company’s “Hear Our Difference” credo. The speaker utilizes custom all-range symmetric driver technology to create a full range loudspeaker in an elegant and finely finished cabinet. Laminated dual-core panels and polymers provide enclosures of maximum strength and acoustic stability. The result is statement-level sound quality for the discerning listener. MarkAudio-SOTA’s medium-sized, two-way bookshelf speaker utilizes custom all-range symmetric driver technology to create a full range loudspeaker. The speakers use a Billow waveguide baffle for optimum dispersion and accurate sound replication in smaller rooms. 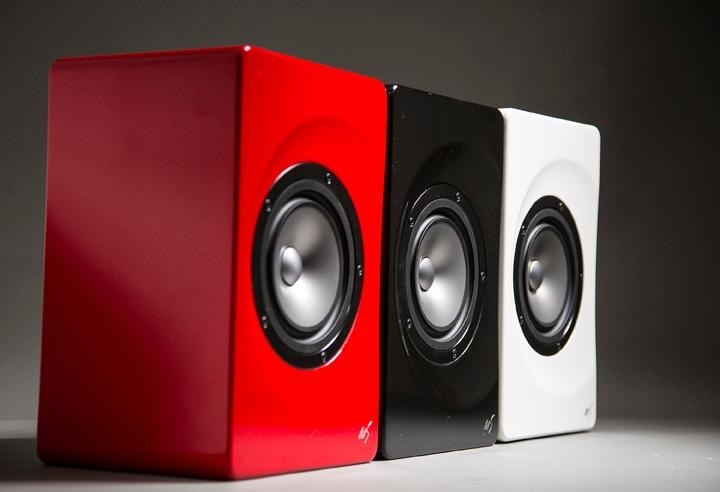 Styled with a clean, minimalist industrial design, the speakers are available in a finely lacquered finish and in three colors (black, red or white).